It is one of cinema’s great opening sequences. The film opens in a sun soaked railway station, that great Western symbol of movement, modernity and progress. But Leone is in no mood to glorify the development of America’s West. Instead, he turns up the sound on the flies, the creaking windmill, the leaking water, and cranks up the tension simply by showing ‘nothing’ for nearly ten minutes. Three men sit around, waiting for their lives to be violently cut short by civilization. As the film later suggests, they were no angels. 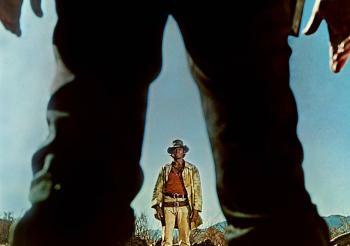 Leone intended Once Upon a Time in the West to replicate the movement of men about to die (Leone is far more interested in the build up to death, than he is of death itself) and it is a bravura opening that establishes Leone’s scythe. From there, Ennio Morricone’s score, Tonino Delli Colli’s cinematography, and the bleakness of Leone’s vision take over. The film is set in a mythical town of Flagstone, a town which the railroad has reached, bringing to it the so-called modern trappings. As new bride and former prostitute Jill McBain (Claudia Cardinale) finds when she travels through the town for the first time, the town seems to have its own order and institutions. However, it is further out West, where the railroad hasn’t quite reached, where chaos still reigns. Jill McBain’s new husband, Brett McBain, and his children are gunned down in cold blood by a ruthless gang. The camera pans up to reveal the leader of the gang – Frank, played by Henry Fonda in one of cinema’s great villainous roles. Leone wanted to subvert Fonda’s usual role by casting him as evil incarnate, shining the camera into Fonda’s blue eyes, and his previously iconically earnest face. Fonda had rarely played villains before – one of the closest is his ambiguous role in Edward Dmytryk’s 1959 film Warlock, a film that Leone references in Once Upon a Time in theWest , and it is easy to imagine this close-up shocking audiences upon its release. However, it was specifically the Wyatt Earp image of Henry Fonda, the noble John Ford figure who laconically leans back on his chair, which Leone was trying to subvert with his casting. Fonda reportedly required a bit of convincing to take on the role in the first place, but later said it was his favourite role. Frank is hired by the town’s evil tycoon Morton (Morton’s corrupted appearance is explicitly made clear by showing him as disabled) to clear Brett McBain off his land. Since neither Frank nor Morton were expecting Jill, further violence is ‘required’. Jill finds herself ‘protected’ by two others – though their help is not particularly altruistic. “Harmonica” (played by Charles Bronson) and “Cheyenne” (Jason Robards) have their own causes for revenge against Frank, and in a continuation of The Good, the Bad, and the Ugly, everybody has their own reasons for acting the way they do. Leone wasn’t simply trying to create a nihilistic statement like his previous work with Clint Eastwood essentially ended up doing. The film is as much about highlighting that the colonisation of the West came about through capitalism, sadistic killers, and dreamers (often all at once), as it is a rollicking action film. Given it was written by two other iconic filmmakers and former film critics, Bernardo Bertolucci and Dario Argento, the film is also full of film references – the intertextual weight of the film reconstructing a mythic West, with the films forming a kind of forgotten framework to American valorisations of its frontier tradition. Further, it’s a view created by outsiders, by Italians no less, whose concepts of the American West would have only been created via the movies themselves. Clearly, Leone sees a West similar to the later John Ford films – the John Ford of The Searchers and The Man Who Shot Liberty Valance rather than the Ford of My Darling Clementine or Stagecoach. This is evident by visual homages to those later films, whether it is ‘doorway’ shots of men who can’t find peace inside, and therefore are stuck ‘outside’, or by setting the film in Ford’s beloved Monument Valley. Leone’s ties to the later John Ford are also evident by the cynical and corrupted views of the West. Leone doesn’t necessarily view the former West as a once-was garden, nor does he shy away from pointing out what was lost in the process of colonisation (displaced Native Americans, water, men). As a result, Leone paradoxically laments the loss of the “old ways,” but critiques the place of the “old ways” in the world. He also pointedly suggests that the advent of civilisation required callous violence, revenge, and self-interest for it to have succeeded. 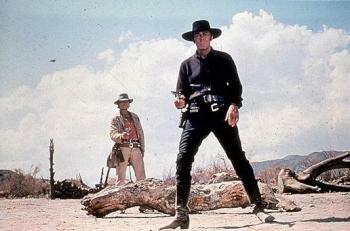 For all its filmic references (other examples include a shot for shot funeral remake of a funeral scene in Shane, an opening which references High Noon, and a link between Jill and Vienna, the protagonist of Johnny Guitar), Once Upon a Time in the West is a vision of the American frontier that few American films dared to show, and perhaps explained why the film bombed upon its initial release.Other Westerns which had similar themes – McCabe and Mrs Miller and Heaven’s Gate – would suffer the same box office fate. Part of the reason this film did eventually become iconic was through the film’s technical brilliance. Morricone’s score is arguably his greatest, whether it was Bronson’s plaintive diegetic harmonica, or the bombastic non-diegetic music that perfectly complemented Leone’s overall vision. Leone’s camerawork operated on an either/or basis – extreme close ups were followed by extreme wide shots and then back again. In an approach which would later influence the likes of Terrence Malick, Leone would have his characters dwarfed by the civilisation which they represented, like insects crawling around in the vastness of the West, despite the progress that had brought them to Flagstone. The acting is much more restrained than Leone’s previous Westerns – though Eastwood and Lee Van Cleef were hardly melodramatic in their Leone roles, and his characters have a world-weary feel to them, as if they were never going to fit into the world around them. The film is also highly stylised, in a manner which would now be viewed as self-consciously cool, but grounded in realism through its long takes and restrained pace. Leone hasn’t won the critical acclaim his career deserved. Perhaps it is because he is simply viewed as a genre filmmaker (an unfair fate which would befall Argento), or one who was too commercially successful with his earlier spaghetti Westerns to be truly taken seriously – as opposed say, to his more serious contemporaries like Michelangelo Antonioni who, to be fair, is highly dated, or Bertolucci who admittedly was a bit too hit and miss, particularly later in his career. But there are perhaps few filmmakers who had such a recognisable style working in commercial cinema, and few filmmakers who were able to successfully marry genre conventions with philosophical and political considerations in such as way that Leone was able to do. Once Upon a Time in the West is perhaps Leone’s finest statement – a film that pays homage to filmic traditions of the West, while simultaneously demolishing their foundations. Footnote : A beautifully restored print of ‘Once Upon a Time in the West’ will be screening on 9th and 11th July in Auckland, and on 16th and 19th July in Wellington (plus elsewhere in the country) as part of this year’s New Zealand International Film Festival programme. .